Amazing opportunity to own a luxury oceanfront condo at Ocean Blue! Ocean Blue consists of 36 one-of-a-kind condos offering dramatic ocean views. Fully furnished with gorgeous, upscale decor and furnishings. There is a large expansive oceanfront balcony accessible through the living room and master suite, Very spacious with room for everyone in your family 5 bedrooms and 4 full baths. The gourmet style kitchen with dual refrigerators and upscale appliances will spark your inner chef. Custom 42" cabinets with crown molding appointed with granite counter. The master suite faces the ocean, with access to the balcony....open the doors while you sleep and hear the waves. The private bath has a jacuzzi tub, double granite sink, walk in shower. TVs are in every room. Ocean Blue features an indoor and outdoor pool, lazy river, sun decks, and more. 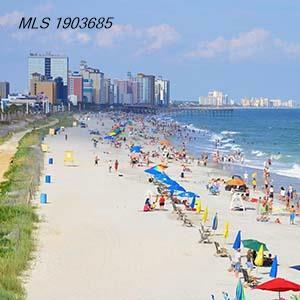 Great location on the south end of Myrtle Beach near airport, Market Common, state park, golf courses, entertainment and more. Come make this luxury condo at Ocean Blue your new home or vacation getaway.